Below you will find information that is essential for your progression on End of the Road.
" Experiences, memories. They are the source of our power and have many uses....but we should never forget to develop ourselves". Experience is gained in many ways, battling monsters, bosses. And even just rping normally without fighting. Experience via rping is known as Roaming exp, this is calculated at a rate of 10% of your word count at the end of each thread. Other methods of experience gain are known as Reward Experience, usually granted by the DM for either battling or completing a thread. It also has many ways to be used. Its primary use however is in developing your character. Each character will start at level 1. Their base start if you will. From that point onwards they can develop by filling the level " gauge" with experience points. Once filled, the gauge will empty and the character will be at the next level of development. The progress of levels, and the experience required to achieve them can be found below. The main goal of leveling your character is to obtain stat points, the main requirement for progression and increasing your characters strengths. Each level will grant your character stat points which you can spend as you see fit on strength, magic, and the like. Keep in mind however that the limits for all of these stats are 9999 (Bar HP/MP, which can exceed these limits if you have certain items, but those are calculated separately anyway). As you level up, you gain a certain number of stat points and vitality points, which are used to increase your stats and your HP/MP, respectively. 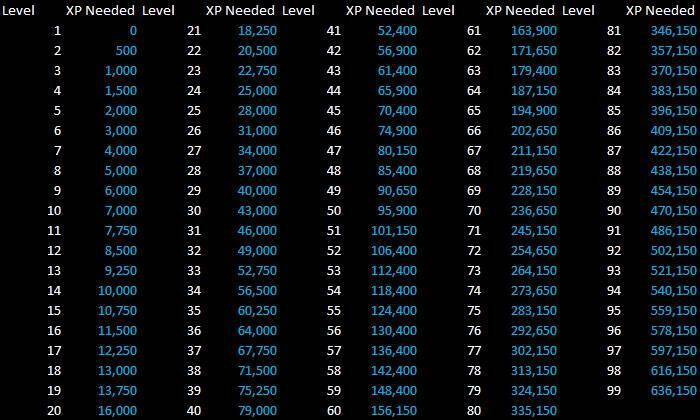 Below is a chart, detailing how many points you get per level. The points refer to both Stat points and Vitality points; for example, at level 2 you get 200 points to divide among the 5 stats, and 200 more points to divide between your HP and MP. Number of Existing Slots x 500 Gil. Ex) X has 3 existing slots and wishes to purchase a new one. 3 x500 =1500. Cost of X purchasing new slot = 1500 gil. Once this is completed, please post it to your Upgrade Page for your character where it will be reviewed by an Administrator. Combat abilities come in multiple levels, for upgrading a lower level technique to a higher level, use the same format as above. There are however a few rules to upgrading Combat Abilities. - Your level will reflect whether or not the CA is accepted, low level characters (under 10) should not be running around with high damage attacks. The damage for CA’s from min to max are listed below. Ensure that your suggestion is somewhere in between.
" Your weapon, like you will grow with time...the more it is used, the sharper it becomes..the more intuned you both become to each other...your weapon has a soul too, and by developing your bond with that soul. You will both become stronger"
Boosting: In the Final Fantasy games, most weapons will have hidden attributes, increasing your attributes. And I’m not just talking about attack power, either. Some weapons will boost your Intelligence, Agility, Luck, and all kinds of other Mods. Well, here on Journey’s End weapons offer the same sort of bonuses. Every time a weapon levels up, it will receive points that the player can use to increase any of their modifers. Weapon Abilities: Some weapons will have special effects attached to them. The Mage Masher, for example, is a low-level dagger that appears in several Final Fantasy games. In nearly all of its appearances, it has a small chance to inflict silence upon its target. Similarly, the weapons on Journey’s End may have hidden effects. After a certain weapon level, players will have to choose between the bonus, and a weapon ability. After a few more levels, the player will receive a similar choice, between creating another new weapon ability, upgrading their existing ability, or taking the modifier bonus. They will receive this same choice once more when their weapons reach their Master level. This creates a direct choice between power and versatility; multiple weak abilities, or one strong one, or just the raw power of the weapon itself. Weapon Abilities work similarly to Combat Abilities, however whereas Combat Abilities are typically specific attacks or techniques, with a few exceptions, Weapon Abilities are typically automatic or constant effects, with a few exceptions. The following is a chart describing exactly what bonuses you get at what weapon levels, and the requirements for each level. Base Weapon (Level 0) Weapons start at this level. No Bonuses. The same rules and leveling chart apply to all weapons, so there is no reason you cannot take your initial weapon all the way to Master Level. However, if for some reason you still wish to have a new weapon, you may undertake a quest to find/buy/receive one. New weapons will usually start at level 0, unless Moded otherwise by the admin running your weapon-hunting quest. There is no limit to the number of weapons you can possess at any time, however… ONLY ONE WEAPON CAN BE IN USE AT A TIME. That means for every action you take, every attack, spell, block, dodge, et cetera, you will only receive the bonus Mods from ONE of your weapons. Each action is tied to a single weapon, and you will only receive the effects from that one weapon. In short, no cheating the system! You can’t find a dozen different weapons and trying to stack their effects. It doesn’t work like that. You CAN, however, have multiple weapons, and then pile all of your Mod bonuses into a particular Mod. For example have one weapon for attacking, one weapon for spell casting, et cetera, and just switch between them. I refer to this as the “Firion approach” because of how Firion is depicted in Dissidia. However, a word of caution, the exp cost of doing it that way is astronomical, and you would be much better off simply leveling your character to receive the same Mod boosts. Limit breaks are the powerful ultimate techniques of a character. They exceed the powers of combat abilities and harness the characters true potential power. Typically though as the limit breaks wield such great power they cannot be used all the time. Rather before a limit break is usable, the limit gauge, a way of measuring the progress to the limit being usable. Must first be filled. Once the limit gauge reaches 100% a person may use their limit. Filing the limit gauge as you can imagine occurs during the heat of battle. The base way to fill the limit gauge is by being attacked. This is called Stotic mode. And is the way every character from creation fills it. In this mode, each attack be it magic or physical will increase the limit gauge by 10%. Keep in mind though, even after the battle is finished, the amount it was filled by in that battle will remain and carry over into the next battle. Stotic however is not the only method of filling the limit gauge. Other Limit Forms, may be rewarded by the admin. Final important note on this topic which leads into the next. The limit gauge does not stop filling at 100%. It can continue to grow higher..
Like with combat abilities Limit breaks have levels. However unlike combat abilities you may only ever create 6 limit breaks. To create a limit you require a limit slot. These cannot however be bought, and can only be obtained by leveling your character to the required level. The first limit slot is obtained at creation and continues for every 10 levels there after up to level 50, you obtain one. To make a limit copy the form below into your updates and follow the same rules for combat abilities. Using a limit will normally cost you 100%of the currently accumulated limit gauge. However, this changes as you level a limit. When you obtain a higher limit level, all levels below that reduce in their cost by half. Note however this NEVER drops below 25%.. Also, regardless of how much it reduces the gauge by. To use a limit you must still hit 100% on the gauge. Trance form is a state of being that occurs when a persons body harnesses the inner potential used by the limit break for itself. A trance state is EXTREMELY powerful and one tranced character can usually take down a boss that a party would be needed for. Whilst in the trance state, all stats are doubled ( excluding hp and mp) and a person is capable of unleashing limit breaks simultaneously. However doing so would likely end the trance state very quickly. In order to activate a trance state however, a person must first have obtained 500% in their limit gauge.Once this has been obtained they may activate their trance form at any time. During this initial activation though, their trance state will still be new and novice. So will have only the base form of trance, which is a strange glow around the persons body. However, Once the first battle after obtaining trance is complete. A person may modify the appearance and additional effects of their trance state. When creating your trance state. Use the following format. When you enter trance, your limit gauge transforms into a trance gauge, which starts at 100%, any action in the trance mode lowers the gauge by 10% . Using a limit in trance, will use up higher amounts of the gauge. From 20% at level 1, to 60% at level 5. When this gauge hits 0, trance ends. And your limit gauge resets to 0. End of the Road allow people who normally prefer a free form style of role play to avoid the mathematics and other complications involved with stat based RP. Whilst for the most part this is a rather simple process there are a few things that must be kept in mind whilst roleplaying as a freeform character. Freeform does not mean free power, at creation your character will be different however still just as weak as a level 1 stat based character. Rather than levels freeform characters will be given ranks which will represent the "rough" level of power that they have, each rank will enable a freeform character to create an additional 3 special abilities which will be allowed to grow more powerful with each rank. Rank ups occur every 10 in character levels, keep a note of your experience pool and check against the leveling table in this guide to see when you can apply one. Due to the nature of the RP some events will showcase stat only based battles. Whilst there is a go around for PVE, stat based characters and freeform will be seperated into different battle parties. Stat VS Freeform PVP represents a bit of a problem due to two conflicting systems, one uses math to determine superiority, the other does not. If the stat person wishes to fight using freeform then his/her levels will be converted to the closest rank to determine battle superiority. If they do not wish to use freeform then the opposite will occur, the DM will determine what your characters statistics SHOULD be using your rank and class and the fight will progress from there. Ultimately, less stuff. Stat based based roleplayers will have a higher level of character customization than freeform players.